The A350 features new all-composite wings that will be common to the three proposed variants. With an area of 443 m2 (4,770 sq ft) it will be the largest wing ever produced for a single-deck widebody aircraft. The geometric wingspan of 64.7 m (213 ft) is 4.5 m (15 ft) greater than that of the A330. This is the same span as the long-range Boeing 777-200LR/777-300ER, which has slightly less area. The wing tip will not sport the traditional wingtip fences, but instead are curved upwards at the final 4.4 metres (14 ft), "sabre-like". The new wing will have 31.9° of sweep, helping to increase typical cruise speed to Mach 0.85 and maximum operating speed to Mach 0.89. A new trailing-edge high-lift system has been adopted with an advanced dropped-hinge flap (similar to that of the A380), which permits the gap between the trailing edge and the flap to be closed with the spoiler. The manufacturer has extensively used computational fluid dynamics and also carried out more than 4,000 hours of low- and high-speed windtunnel testing to refine the aerodynamic design, achieving the final configuration of wing and winglet on the "Maturity Gate 5" on 17 December 2008. The wings are produced in the new £400M/46,000 square metres (500,000 sq ft) North Factory at Airbus Broughton, employing 650 workers, in a specialist facility constructed with £29M of support from the Welsh Assembly Government. All three A350 XWB family members share the same wing planform – with a 64.7-metre wingspan, a total area of 442 sq. metres, and high swept leading edge. In addition the internal wing structure will be scaled to meet the specific requirements of each aircraft variant. Innovative concepts applied to the A350 XWB wing’s high-lift devices will reduce noise and drag while also improving the aircraft’s low-speed performance. One of these innovations is the stream-wise deployment of trailing-edge flaps. On a traditional swept-wing jetliner, the outboard flaps extend at an angle to the airflow. For the A350 XWB, flap deployment is along the direction of flight – resulting in better lift efficiency and improved low-speed performance, while reducing aerodynamic-generated noise. Other A350 XWB wing enhancements include the adoption of a drop-hinge mechanism to improve the flap’s deployment kinetics, along with the introduction of a downwards movement for the upper wing spoilers to fill the gaps that occur when flaps are extended. In addition, the A350 XWB’s flight computer will perform in-flight trimming of the inboard and outboard flaps, creating a variable camber wing that adapts to different flight conditions. The avionics will be a further development of the integrated modular avionics (IMA) concept found on the A380. 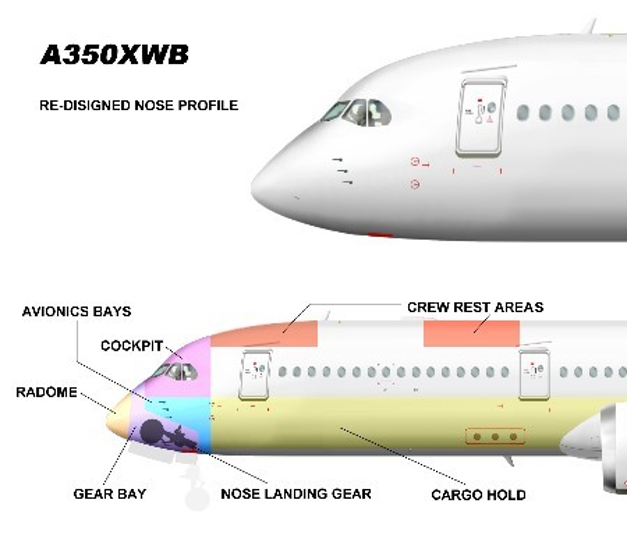 The A350's IMA will manage up to 40 functions (versus 23 functions for the A380) such as undercarriage, fuel, pneumatics, cabin environmental systems, and fire detection. Airbus says benefits will include reduced maintenance and lower weight because IMA replaces multiple processors and LRUs with around 50% fewer standard computer modules known as line-replaceable modules. 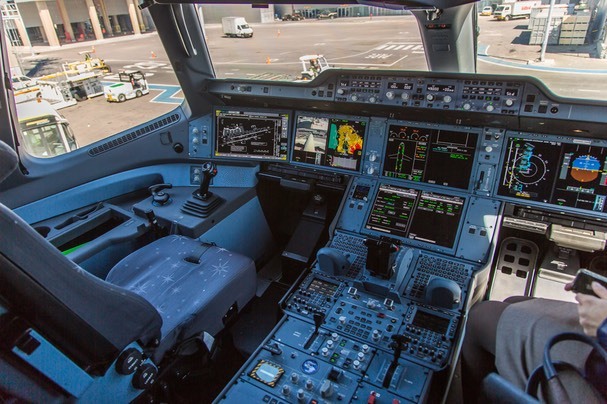 The IMA runs on a 100-Mbit/s network based on the avionics full-duplex (AFDX) standard, already employed in the A380 instead of the Arinc 429 system on the A330/A340. The Trent XWB family comprises two basic engines to power the three A350 variants. The baseline 370 kN (83,000 lbf) thrust version for the A350-900 will be derated to 330 kN (74,000 lbf) and 350 kN (79,000 lbf) for the -800, while an upgraded 432 kN (97,000 lbf) thrust version will power the A350-1000. The higher rating 432 kN (97,000 lbf) engine will have some modifications to the fan module - it will be the same 118-inch diameter but will run slightly faster and have a new fan blade design - and some increases in temperatures brought by new materials technologies coming from its research programmes. The basic 248t MTOW -800 will be offered with a 330 kN (74,000 lbf) sea-level-thrust rating, while the 279t MTOW option will have 350 kN (79,000 lbf) thrust. 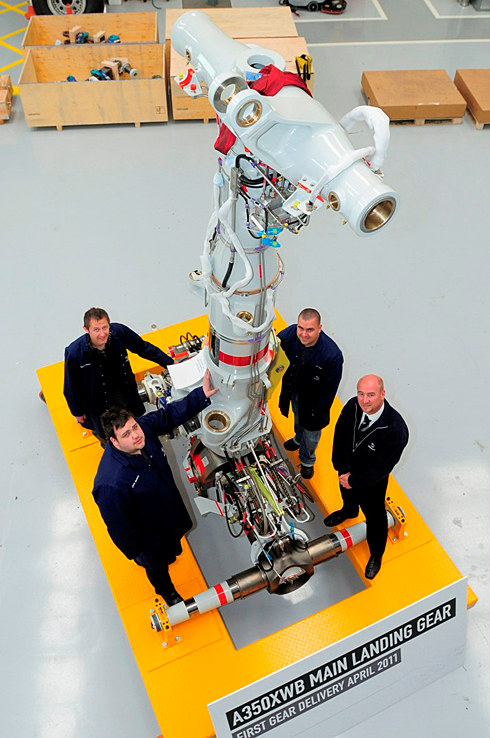 Airbus also plan to offer a 'hot and high' rating option flat-rated at 350 kN (79,000 lbf) at higher altitudes and temperatures which uses the full capability of the -900's 370 kN (83,000 lbf) thrust engine prompted by the operating requirements for Middle Eastern launching customers Qatar Airways, Emirates, and Etihad. The Trent XWB will feature a 118-inch (300 cm) fan diameter and the design will be based on the advanced developments of the Trent 900 (Airbus A380) and Trent 1000 (Boeing 787). 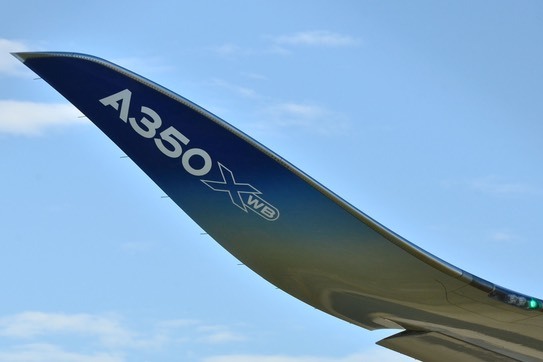 The Trent XWB may also benefit from the next-generation reduced acoustic mode scattering engine duct system (RAMSES), which is a noise-dampening engine nacelle intake and a carry-on design of the Airbus's "zero splice" intake liner developed for the A380. Engine thrust-reversers and nacelles will be supplied by US-based Goodrich Corporation. The A350 XWB will feature a 1,268 kW (1,700 hp) Honeywell HGT1700 auxiliary power unit, which has 10% greater power density than the previous generation of Honeywell's 331 APU family. Honeywell will also supply the air management system: the bleed air, environmental control, cabin pressure control and supplemental cooling systems. The ram-air turbine will be supplied by Hamilton Sundstrand and will be located in the lower surface of the fuselage. The generator requirement for the ram air turbine is 100 kVA compared to 150 kVA for the A380. Parker Hannifin will supply the complete fuel package: inerting system, fuel measurement and management systems, mechanical equipment and fuel pumps. The fuel tank inerting system will feature air-separation modules to generate nitrogen-enriched air that will be used to reduce the flammability of fuel vapour in the tanks. Parker will also provide hydraulic power generation and distribution system: reservoirs, manifolds, accumulators, thermal control, isolation, software and new engine- and electric motor-driven pump designs. Parker estimates the contracts will generate more than US$2 billion (€1.5 billion or £1 billion) in revenues over the life of the programme.